88. But I'm the pawn! I'm the swing vote! #88. But I'm the pawn! I'm the swing vote! 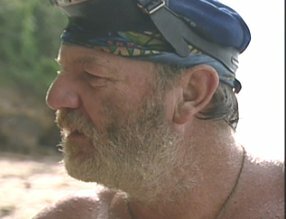 "Big" Tom Buchanan is one of the funniest people I have ever seen on Survivor. 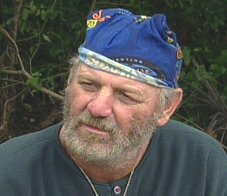 The big man from Virginia was always good for a laugh, he would say the most outrageous things on TV, and he's actually the #1 ranked Survivor on this list. Tom is going to end up in the Funny 115 more times than any other player (8 moments in all), so it's an honor for me to present his first actual appearance on the list. Yes, my friends, this is where we pop our Tom Buchanan cherry. Nearly every Tom moment on this list is going to be something he did on purpose, so it's kind of weird to say that this is a moment where he wasn't even trying to joke around. Tom was being dead serious here, he was trying to play a harder game than he really should have attempted... and it ended up being one of my favorite moments of unintentional humor on the list. So anyway here we go. Welcome to one of the most ridiculous arguments I have ever seen on Survivor. And it involves Tom Buchanan trying a explain a concept he didn't quite fully understand. It was the final five in All-Stars, and Tom had set himself up into a wonderful position in the game. 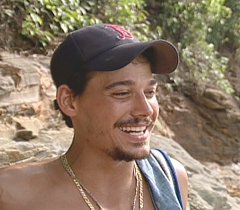 He was best friends with Rob and Amber, he was the very important "third vote" they desperately needed, and he was currently positioned smack dab in the middle of everything. He had Rob and Amber on one side... he had Jenna and Rupert on the other side... and then there was ol' Tom, sitting pretty in the middle. He could choose to go with either side, he could change the game around if he wanted to, and best of all, he knew it. Tom Buchanan was the all-important swing vote. The best part about Tom's plan was that Rob and Amber completely underestimated him. Tom had played the "dumb hillbilly" card so well that he was considered to be little more than a pawn. Rob and Amber knew that Tom would do whatever they said, and Tom loved it. He loved being "the pawn". He loved making people think he was an idiot. Because all he had to do was walk over to Rob before the vote, ask him who the target would be, and... bam... Big Tom was safe for three more days. Just the way he liked it. It was a role he was born to play. So anyway Tom coasted by as the pawn all the way to the final five, when he was suddenly thrust into a position of power. Because now Tom had the option to go one of two ways. Should he stick by his friends Rob and Amber, and do what they said one more time? Or should he jump ship over to Rupert and Jenna? After all, Tom Buchanan was officially now the swing vote. He could do anything he wanted to at this point. So what does Tom do? Which way does he decide to play it? Why, he does it in the worst way possible, of course. He calls himself "the swing vote" in a conversation with Rob. And he does it right before Tribal Council! 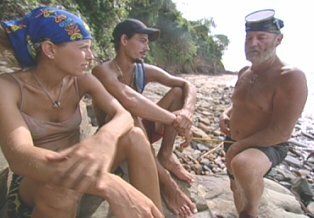 It was the day of the vote (day 36), and Rob and Amber saw Tom fishing down by the beach. They had been a little wary of Big Tom's motives recently, and Rob wanted to have a pre-vote discussion about loyalty, so they called him over. They told Tom to come join them up on the rocks. Basically this was because Rob wanted to feel Tom out, to see where the guy stood. Both Rob and Amber thought that Tom had been acting a little squirrelly lately, and there had been rumors that Tom had been trying to get Rob voted out. 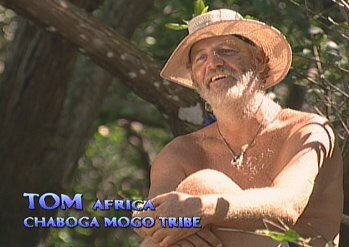 So Rob called Tom over, he confronted him over tonight's voting plans... and the conversation that followed ended up being one of my favorite Survivor arguments of all time. Enjoy. Rob: "Let's be honest here. For at least one time in this game, let's get to the truth. Have you or have you not tried to mark me to get me kicked out of this game. Yes or no?" Rob: "Have you gone to anybody to try to get me out?" 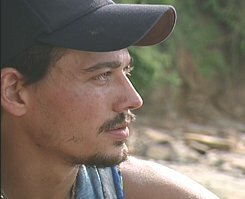 Rob: "Where does our alliance stand now? When we take Jenna out tonight, then what happens? Then we take out Rupert?" Tom (stammering): "Well, I don't know. You tell me." Rob: "Why do I have to tell you??" Tom: "Because I'm the pawn. I told you, I'm the swing vote." Amber (incredulous): "No! You're with us! There is no swing! We're a group. There is no swing!" Tom: "Rupert and Jenna are two. All they need is one, and then... smash." Rob and Amber (simultaneously): "No!" So anyway, yeah. Tom was voted off. No real surprise. But I'll never forget the time he tried to play the game like Rob Cesternino. Tom tried to scheme, he tried to manipulate, he tried to play both sides against one another... and it's fairly safe to say that he failed on all accounts. In fact, I'm not entirely sure he even knew what a pawn was. 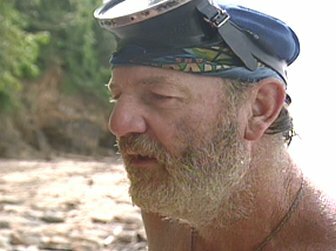 Still, it did end being one of my all time favorite Survivor arguments. Tom: I'm the pawn! I'm the swing vote! Rob and Amber: NO, YOU'RE NOT!! !